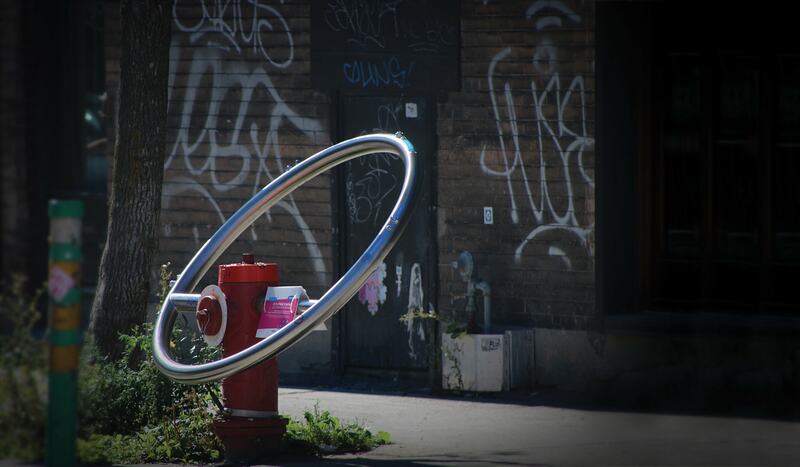 A new design that uses fire hydrants to provide drinking water has been introduced throughout Montreal following a pilot scheme last year. Called the Bornéo system, it works by attaching a 1.35-metre metal ring to a hydrant that provides drinking water through four valves. Designing the solution hand-in-hand with Montreal’s fire department ensured the viability of the project and allows complete access at all times to the hydrant. In 2014, two Bornéo devices were installed in Plateau Borough and tested in a public pilot project. This past Canadian summer, the borough deployed three more. Other municipalities have shown an interest and the team is looking to make it available on a wider scale. Each device costs the city C$5,150 (US$3,950) but according to Dubois this is a lot less costly then bringing water to a park to install a regular water fountain as Bornéo is simply adding to the existing water system. In winter, the fountains will be removed and stored. Each spout gives easy access to water to adults, children and also people in wheelchairs; an internal tubing system prevents water from becoming heated under the sun and ensures hygiene. “It’s funny to think that this project started in Montreal where there is about four months of warm summer weather for public fountains,” observed Dubois. Although the red fire hydrant is distinctly North American, Dubois believes it can be easily adapted to existing infrastructure so long as the water used is potable.